It's been a while since I did a transportation as homes post, but when Wreck reader Grouse sent me a couple of website links, I was inspired! First the traditional gypsy wagons, above and below. From the website gypsywaggons.co.uk, which carries ads for classic bowtop, showman and gypsy caravans. Among my favourites are the beautifully restored, 1909 Burton caravan above and below. Definitely not a wreck, but ready for its final decorative paint job. To get an idea of what decoration can do for a wagon, this gorgeous renovation of a pre-1914, Thomas Of Chertsey showman's wagon (below) is on the market at offers around £20k. Details here. If what you're after is something cheaper, there were some very cute, towable bowtop wagons on the list. The ones below are all around the £6-7k mark. More here. 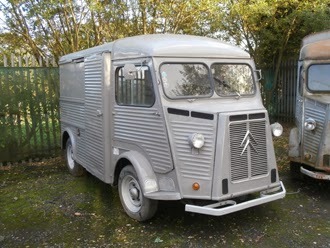 If all of that seems a bit too retro, how about a Citroen H Van? French, snub-nosed cuties with a particular penchant for being used as catering wagons. It's on the market at £15,220. New MOT, no road tax, no VAT. 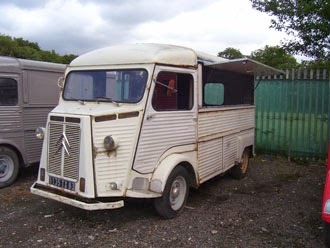 Or, if you're up for renovating one yourself, the 1977 HY IN2 catering van below is sold as is at £4995. More details and more vans here.